*width crafted to suit your finger size. 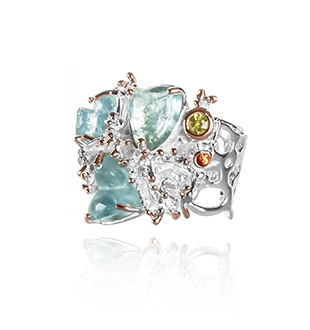 A solid sterling silver ring with 18karat rose gold accents featuring aquamarine, peridot, and orange sapphire. Also available with other metal finishes and gemstones. 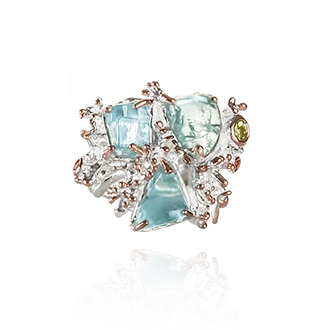 The aquamarines we use are as they are found in nature, so the length and the height of this ring depends on those hand selected for you by Keiko. Keiko Uno’s Jewel of the Sea series is inspired by the vibrant colours of the spectacular Corynactis Viridis sea anemone, commonly known as the jewel anemone. The Jewel of the Sea series forms part of Keiko Uno’s luxury sterling silver Rockpool Collection.